The 2016 Stanley Cup Finals was the championship series of the National Hockey League's (NHL) 2015–16 season, and the culmination of the 2016 Stanley Cup playoffs. The Eastern Conference champion Pittsburgh Penguins defeated the Western Conference champion San Jose Sharks four games to two to win their fourth championship in franchise history (winning the clinching game of all four on the road). Penguins captain Sidney Crosby was awarded the Conn Smythe Trophy as the most valuable player of the playoffs. The Penguins finished ahead of the Sharks during the regular season, giving them home ice advantage in the series. The series began on May 30 and concluded on June 12. This was the first Stanley Cup Finals since 2007 to feature a team making their Finals debut. This was the first playoff meeting between teams from Pittsburgh and the Bay Area since the Penguins swept the Oakland Seals in the 1970 Stanley Cup Quarterfinals. The Eastern Conference had home-ice advantage in consecutive seasons for the first time since the 2004 and 2006 Finals. For the first time since 2011, neither the Chicago Blackhawks nor the Los Angeles Kings won the Stanley Cup. This was Pittsburgh's fifth Finals appearance, and first since winning the Cup in 2009. The Penguins had made the playoffs every year since their win in 2009, but hadn't won a single game in the conference finals in that span. After losing to the Rangers in the playoffs for the second consecutive year, the Penguins made waves during the 2015 offseason, trading for forwards Phil Kessel and Nick Bonino, re-signing defenceman Olli Maatta and forward Bryan Rust, and signing centres Matt Cullen and Eric Fehr in free agency. General manager Jim Rutherford fired head coach Mike Johnston on December 12, 2015, after the team limped to a 15–10–3 start. Johnston was replaced with Wilkes-Barre/Scranton Penguins coach Mike Sullivan, who went 33–16–5 over the remainder of the season. The Penguins made three major trades before the trade deadline, acquiring defencemen Trevor Daley and Justin Schultz and forward Carl Hagelin. After goalie Marc-Andre Fleury suffered a concussion on April 2, the team turned to rookie Matt Murray for the final week of the regular season and the majority of the playoffs. Pittsburgh finished with 104 points (48–26–8) in the regular season to finish second in the Metropolitan Division. Centre and team captain Sidney Crosby led the club in scoring during the regular season and finished third in the league with 85 points. In the playoffs, the Penguins eliminated the New York Rangers in five games after losing to them in 2014 and 2015, the Presidents' Trophy-winning Washington Capitals in six games, and the defending conference champion Tampa Bay Lightning in seven games. This was San Jose's first Finals appearance in their 25-year history. During the offseason the Sharks hired former New Jersey Devils head coach Peter DeBoer to replace Todd McLellan and traded for former Kings backup goalie Martin Jones. San Jose also picked up defenceman Paul Martin and right wingers Joel Ward and Dainius Zubrus via free agency. Before the trade deadline, the Sharks acquired forward Nick Spaling, defenceman Roman Polak, and goalie James Reimer. San Jose earned 98 points (46–30–6) to finish third in the Pacific Division. Centre Joe Thornton led the club in scoring with 82 points, and finished tied for fourth in the league, followed closely by centre and team captain Joe Pavelski with 78 points and defenceman Brent Burns with 75 points. In the playoffs, San Jose avenged their 2014 loss to the Kings, a series in which they blew a 3–0 series lead, by defeating Los Angeles in five games. San Jose also eliminated the Nashville Predators in seven games, winning every home game in the series, and the St. Louis Blues in the Conference Final in six games. Game one remained scoreless until Bryan Rust and Conor Sheary scored a minute apart for the Penguins midway through the first period. San Jose came back in the second period with a power play goal by Tomas Hertl at 3:02 and the tying goal by Patrick Marleau at 18:12. Despite 18 third-period Pittsburgh shots directed towards Martin Jones, the score remained tied at two until very late in the game, when Kris Letang found Nick Bonino wide open in front of the net to give the Penguins the lead. The Penguins held off the Sharks in the final minutes to take game one 3–2. Game 2 began with a scoreless first period which featured 11 Penguins shots and only six from the Sharks. Midway through the second period, a series of San Jose miscues led to a Pittsburgh goal. After Roman Polak nearly gave the puck away to Phil Kessel, Brenden Dillon was stripped by Carl Hagelin, who gave it to Nick Bonino for a tip-in by Kessel. The Sharks tied the game late in the third on a goal by Justin Braun, which sent the game into overtime. Early in overtime, a quick shot by Conor Sheary beat Martin Jones to give the Penguins a 2–1 win and 2–0 series lead. Ben Lovejoy started off the scoring in game three at 5:29 of the first period, when his point shot deflected in off Roman Polak. The Sharks tied it at 9:34 on a Justin Braun goal. Midway through the second period, the Penguins took the lead back when Patric Hornqvist tipped in another Lovejoy point shot. In the third period, Nick Bonino high-sticked Joe Thornton, and in the dying seconds of the four-minute power play, Joel Ward fired a slap shot past Matt Murray to tie the game. In overtime, Joonas Donskoi roofed a tough-angle shot over Murray's shoulder for the game winner. At 7:36 of the first period, Phil Kessel took advantage of a poor Sharks line change and fired a shot that rebounded off Martin Jones and directly to Ian Cole, who scored his first playoff goal. This marked the seventh consecutive game in which the Penguins had scored first. In the second period, Sharks forward Melker Karlsson was called for interference against Eric Fehr, and on the ensuing power play, Evgeni Malkin tipped in a Kessel shot for the Penguins' second goal. During the third period, Karlsson scored again to cut the deficit to one, but the Penguins regained a two-goal lead with 2:02 left when Eric Fehr beat Jones on a breakaway. Game five started quickly, with four goals scored in the first 5:06 of the game. Brent Burns gave the Sharks their first lead of the Final at 1:04, slipping it past Murray on the right post. San Jose scored again at 2:53, when Logan Couture deflected in a shot from Justin Braun. Less than two minutes later, Sharks forward Dainius Zubrus got called for delay of game after shooting the puck over the glass. On the ensuing power play, a Malkin shot deflected off Braun's skate and past Jones, cutting the deficit to 2–1. Less than a minute later, Brenden Dillon gave away the puck to Nick Bonino, who took a shot that was deflected in by Carl Hagelin. Later in the first period, during a Pittsburgh power play, a Phil Kessel wrist shot bounced off both posts but stayed out. Later in the period, Dillon passed down low for Couture who sauced a backhand pass to Karlsson, who scored to regain the lead for the Sharks. San Jose took just 15 shots in the second and third period combined, but Jones withstood a massive 46 shots from the Penguins to stave off elimination. Joe Pavelski provided an empty-net goal to force a sixth game. A power play drive from Brian Dumoulin started the scoring early in game six. During the first intermission, a tribute to Gordie Howe was played, as he died on June 10. San Jose tied it up in the second period when Logan Couture took a pass from Melker Karlsson and fired a shot past Murray. Just over a minute later, Pittsburgh regained the lead when a shot by Kris Letang ricocheted off Martin Jones and in. Despite facing elimination on home ice, the Sharks managed only two shots on goal in the third period, and an empty-net goal from Patric Hornqvist sealed the win for Pittsburgh. The Penguins won the fourth Stanley Cup in franchise history, clinching all four on the road. The 2016 Stanley Cup was presented to Penguins captain Sidney Crosby by NHL Commissioner Gary Bettman following the Penguins' 3–1 win over the Sharks in game six. 1 Played both centre and wing. Jim Britt (Director of Team Operations), Dan MacKinnon (Director of Player Personnel), Randy Sexton (Director of Amateur Scouting), Derek Clancey (Director of Pro Scouting). Pittsburgh broke the 1938 Chicago Black Hawks' record of eight with ten U.S.-born players on a Stanley Cup winning team: Nick Bonino, Ian Cole, Matt Cullen, Brian Dumoulin, Phil Kessel, Ben Lovejoy, Kevin Porter, Bryan Rust, Conor Sheary, and Jeff Zatkoff. An 11th American, Beau Bennett, was traded mid-season (see below). Pittsburgh included the head team physician for the first time on the Stanley Cup. In 1991, 1992, and 2009 Dr. Charles Burke was not engraved on the Stanley Cup. All players listed above received Stanley Cup rings. Gilles Meloche was the goaltending coach for Pittsburgh's Cup wins in 1991, 1992, and 2009. His role was changed to Special Assignment Scout, so his name was left off the Stanley Cup in 2016. However, he was awarded his fourth Stanley Cup ring. Other scouts left off the Cup but got rings were pro scouts Al Santili and Ryan Bowness, amateur scouts Colin Alexander, Scott Bell, Brain Fitzgerald, Luc Gauthier, Frank Golden, Jay Heinbuck, Wayne Meier, Ron Pyette, Casey Torres, and Warren Young, and European scouts Patrick Alivin, Petri Pakaslahi, and Tommy Westlund. Many other members of Pittsburgh's staff were also left off the Cup, but still received championship rings. The Pittsburgh Penguins went on to win the Stanley Cup next year. This time, they defeated the Nashville Predators in six games. The San Jose Sharks, on the other hand, lost in the first round to the Edmonton Oilers in six games after they reached the finals. In the U.S., the Final was split between NBC and NBCSN. NBCSN aired two games of the series while NBC aired the other five (if necessary). On May 27, NBC Sports announced that if the series was tied at 1-1 entering game three, then it would have aired on NBC and game four televised on NBCSN. However, if one team led 2–0 (as this eventually happened), game three moved to NBCSN and then game four on NBC. The games were broadcast nationally on radio via the NBC Sports Radio network. In Canada, the series aired on CBC Television (through Hockey Night in Canada, as produced by Sportsnet through a brokerage agreement) in English, and TVA Sports in French. ^ "Metallica to play anthem before Game 4". NHL.com. National Hockey League. 2016-06-06. Retrieved 2016-06-06. ^ "Train's Pat Monahan to perform anthem for Game 6". NHL.com. National Hockey League. 2016-06-11. Retrieved 2016-06-12. ^ a b "Stanley Cup Final schedule". NHL.com. New York City: NHL Enterprises, L.P. May 26, 2016. Retrieved May 26, 2016. ^ Crosby, Wes (May 30, 2016). "Penguins score late to win Game 1 against Sharks". NHL.com. Pittsburgh: NHL Enterprise, L.P. Retrieved May 30, 2016. ^ Graves, Will (May 31, 2016). "Penguins edge Sharks 3-2 in Game 1 of Stanley Cup Final". Associated Press. Pittsburgh: AP News. Associated Press. Retrieved May 31, 2016. ^ Graves, Will (June 2, 2016). "Penguins edge Sharks 2-1, take 2-0 lead in Stanley Cup Final". Associated Press. Pittsburgh: AP News. Associated Press. Retrieved June 2, 2016. ^ Gilmore, Eric (June 4, 2016). "Sharks win Game 3 in OT, first of Cup Final". NHL.com. San Jose: NHL Enterprise, L.P. Retrieved June 4, 2016. ^ Roarke, Shawn P. (June 6, 2016). "Penguins win Game 4, one victory from Stanley Cup". NHL.com. San Jose: NHL Enterprise, L.P. Retrieved June 6, 2016. ^ Crosby, Wes (June 9, 2016). "Sharks win Game 5, keep Penguins from Stanley Cup". NHL.com. Pittsburgh: NHL Enterprise, L.P. Retrieved June 9, 2016. ^ Gilmore, Eric (June 12, 2016). "Penguins win Stanley Cup, defeat Sharks in Game 6". National Hockey League. Retrieved June 13, 2016. ^ "NBC Sports Group to present every Stanley Cup playoff game for fifth consecutive year" (Press release). Stamford, Connecticut: NBC Sports. April 6, 2016. Retrieved April 8, 2016. ^ "NBC Sports switches TV schedule for Stanley Cup Final". Sports Illustrated. New York City: Time Inc. May 27, 2016. Retrieved May 28, 2016. ^ Thomas, Ian (May 3, 2016). 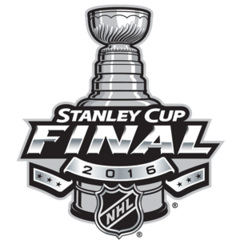 "NBC Sports Radio Named Terrestrial Partner For '16 Stanley Cup Final". Sports Business Journal. American City Business Journals. Retrieved May 5, 2016. ^ "The Final Stage is Set: Sportsnet Announces 2016 Stanley Cup Final Broadcast Schedule" (Press release). Toronto: Sportsnet. May 26, 2016. Retrieved May 30, 2016.